Kant's Metaphysical Foundations of Natural Science is one of the most difficult but also most important of Kant's works. Published in 1786 between the first (1781) and second (1787) editions of the Critique of Pure Reason, the Metaphysical Foundations occupies a central place in the development of Kant's philosophy, but has so far attracted relatively little attention compared with other works of Kant's critical period. 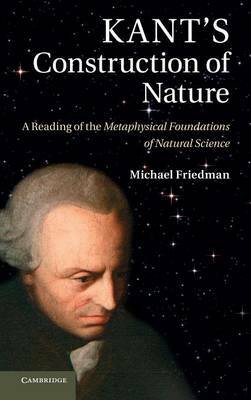 Michael Friedman's book develops a new and complete reading of this work and reconstructs Kant's main argument clearly and in great detail, explaining its relationship to both Newton's Principia and eighteenth-century scientific thinkers such as Euler and Lambert. By situating Kant's text relative to his pre-critical writings on metaphysics and natural philosophy and, in particular, to the changes Kant made in the second edition of the Critique, Friedman articulates a radically new perspective on the meaning and development of the critical philosophy as a whole.